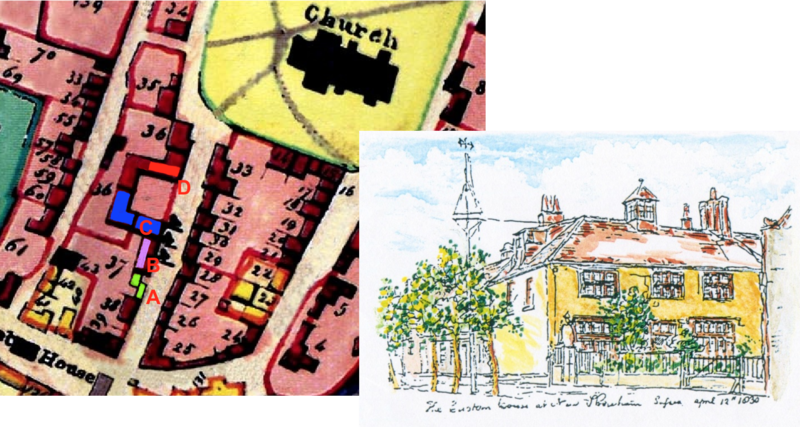 Shoreham’s earliest known Custom House was in Church Street prior to the 1750’s where it was situated on the site subsequently built over with Countess of Huntingdon Chapel (today the Co-operative goods store). The Custom’s store was immediately north of it until the mid-eighteenth century when it was extended to form the private dwellings of numbers 9 and 11. In turn next door to that was a circa 16th century set of buildings of substantial size arranged on three sides around a square courtyard or garden with the open side fronting on to the street and it is to here in the south wing that the Custom House moved next. The Collector was in overall charge of all the men and staff at the Custom House in UK ports. Next was the Comptroller who was responsible for the financial accounting. Surveyors supervised the remainder of the staff although at Shoreham there were also Tide Surveyors who were the next step down from the Surveyor and were responsible for Tide Waiters. Coal Meters approved the correct measures of coal quantities and payment of duty. Boatmen were probably the lowest rank in the Customs and manned the cutters and boats used by the officers in pursuance of their business. In those days the life of a Customs man had its demands, dangers and stresses as suggested by events involving two of the officers mentioned in the records. One day in 1776, one Collector, Albinus Pelham and his wife were holding a social evening there but when Albinus failed to show his wife went looking for him and eventually found that he had hung himself in their bedroom. Another Collector, John Bridger Norton, was robbed and murdered in 1795 between Southwick and Shoreham by two men from the Westminster Militia that were encamped nearby. 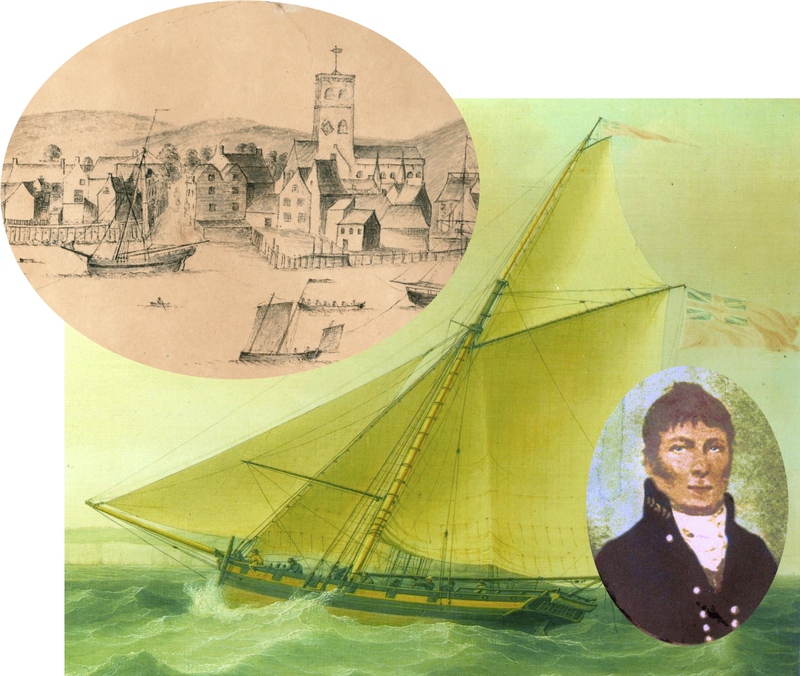 Captain John Butler’s own sketch (top) of his cutter ‘Hound’ moored below Church Street; a Customs cutter of the period under sail (all cutters were built to the same specifications); inset Captain Butler. There was more than one Custom cutter bearing the name ‘Hound’ as one with that name was lost in 1790 and replaced by another with the same name. In addition to the ‘Enterprise’ having being stationed at Shoreham in the 1780’s a Customs House minute of 7th July 1806 shows that the cutters ‘Swan’ and ‘Hound’ were also subsequently based there. Other records also indicate that the ‘Stag’ and ‘Swallow’ cutters spent some time stationed at Shoreham. We know where many of the officers lived, particularly the cutter captains and controllers. Of the cutter commanders Thomas Amos who at various times captained three different Customs vessels lived in the house on the top corner of East Street with St. Mary’s Road – Tide Surveyor Nicholas Roberts lived next door. John Roberts Hawkins resided a few doors down at Chantry House; John Butler’s family house was on the east side of Church Street by the churchyard gate and was later purchased by Nathaniel Woodard to found his first school; John Tate was at Shoreham house on the west side of John Street. Collectors and Comptrollers sometimes ‘lived in’ the house behind the main Custom House as did at various times John Pelham, John Roberts and Henry Partington although the latter moved about a lot and also spent time at three other ‘digs’ in Church Street including the Manor House (now number 25). John Bridger Norton lived at the house next to the Customs buildings in the northern half of the courtyard and Thomas Edwards owned and lived at number 18, previously the home of at Henry Roberts Shoreham’s famous hydrographer who sailed with Captain Cook to Australia. Officers were required wherever possible to reside in accommodation as near to the Custom House as possible as they were always ‘on call’ having to attend when summoned at short notice. Other officers living in Church Street were Harry Butler (brother of Captain John Butler) at what is now number 11, Thomas Mearsh at 5, John Foster at a house that was later to become 10 and 12, and John Snook was at 26 better known in later years as the residence of the Burtenshaw blacksmith family. Rice Jones resided at the house on the corner of the twitten with Church Street that about that time was the Swan Inn. Others lived at the western end of the High Street, Ship Street and John Street but two exceptions were James Legg of Southwick and Thomas Norton of Kingston who, if they did not travel in each day to Shoreham, perhaps manned the Customs Watch House at Kingston monitoring incoming shipping at the harbour mouth. Many were employed for their sea going experience. The pay for most men below senior ranks was not generous but like all Customs personnel they did enjoy a proportion of the sale of seized goods. Subsequently, even the lower ranks such as Rice Jones for example, a Tidesman, Henry Edwards and John Snook, all boatmen, managed between them to accumulate sufficient funds to be able to acquire a number of properties around the town. 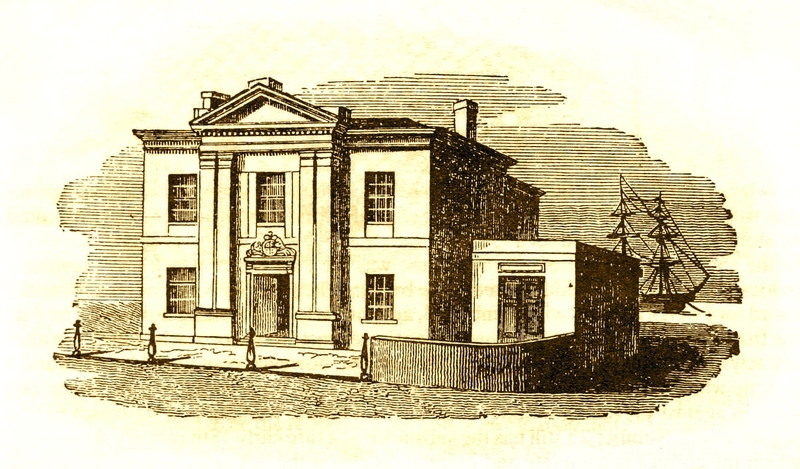 The Roberts family owned the Custom House and the land around it for many years:- John Roberts from 1782 until 1794, John Pelham Roberts 1795 to 1814 and finally John Roberts until G.H.Hooper acquired this and the land north of it by 1830. Beneath the north wing of the building were wine cellars that were doubtless also used to store contraband seized by the Customs consisting of one extensive arched cellar constructed of chalk blocks measuring 54 feet in length, 16 feet wide and 8 feet in height. It still survives, now beneath number 21, Church Street that was built over it. 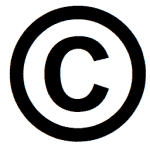 The land now covered by no’s 13 to 23 came into the ownership of G.H. Hooper, a property developer and descendant of the ancient Poole family of Shoreham. Sadly Hooper later demolished the old buildings in after having built the new Custom House in the High Street (and incidentally in doing so also replaced the Poole family’s lovely old medieval mansion house there). 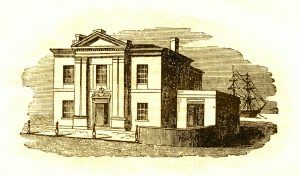 Just a few years earlier in 1825 the Royal George in the High Street was described by a visiting judiciary as “nothing more than a pot house in a nest of smugglers” and it is to be wondered if that clientele had the courage to continue meeting there after the Custom House was built right alongside it. The Customs remained here until 1886 when they moved to Kingston and the High Street building became the Town Hall.